Her voice rose in pitch as words rushed from her mouth. Her hand gestures became frantic and she barely paused to take a breath. I knew I needed to allow her to let off steam before stepping in with my signature style of asking her a question; a question I was almost certain I knew the answer to. During the first 10 minutes of our conversation, Ms K had offloaded how overwhelmed and stressed she’d been feeling since our last session together. Between managing her clients as an education consultant, running her home, and caring for her elderly mother, she felt like all the balls she’d been juggling had hit the ground with a resounding thud. When she slowed down and heaved a huge sigh from her chest, I knew it was time for my question. At that, she chuckled and grasped her head, and I knew my assumption was right, long before she uttered a hushed, “No,” and the list of reasons why she hadn’t, the main one being lack of time. Ms K. was of the belief that taking time to write things down would strip her of time rather than grant her more, leading to her juggling a multitude of work-home thoughts in her head, each wrestling for her attention. Yet, the truth is: offloading through a pen would do the very opposite of what she’d been experiencing. The simple act of dedicating some time to writing things down would grant her more mental capacity to manage tasks awaiting her, resulting in having more time to do them. Writing isn’t something alien to Muslims or Islam. In fact, putting pen to paper features heavily in Islamic history, and it’s a major reason why we have bound copies of the words of Allah today, as well as traditions of Prophet Muhammad . Through the act of writing things down, they preserved experiences and knowledge and captured time for us to benefit from today. From stories of old and what is to come long after we’ve expired our time on Earth, the companions of the Prophet penned knowledge before modern research discovered the myriad of benefits of putting pen to paper, which include: improving memory, gaining clarity, retaining information, maintaining physical well-being, and increasing creativity. In fact, Allah in His infinite knowledge and wisdom taught us more than 1400 years ago that it’s through the pen that we gain knowledge. We inherently possess no knowledge and know nothing until He grants us knowledge. This is reinforced by the fact that Prophet Adam knew nothing of creation until Allah taught him their names. We are set apart from other creatures in that we are possessors of knowledge, and He has taught us to propagate and preserve what we know through the art of writing through the use of a pen. Through writing, we learn, expand, and grow — one generation to another. So, if there was ever a great time to whip out your favourite notebook and pen, it would be when you’re feeling unwell. It’s important to note that these benefits come from the action of writing by hand as opposed to typing on a keyboard or touchscreen device, which has become all too common in our digital age. Just like Ms K. needed to put pen to paper to gain clarity and a better work-home balance, you have complete capability to benefit from writing, even if you’re not a writer and if you believe you’re short on time. Here are some ways you can. If you’re in the habit of writing everything digitally (especially on your phone), make a pledge to switch to writing things on paper. After being so accustomed to tapping on a screen, mostly without much conscious thought, in order to develop a new muscle of writing on paper, take a moment to pause the next time you’re about to write digitally. This pause gives you room to choose differently for yourself. It’s the point you can consciously put pen to paper. The more you practice pausing before writing on your phone, the easier it’ll be to break out of the habit and into a new one. Having the means to write things down is a key component of being able to write when the time calls for it. There’s nothing worse than a wave of words hitting you, crying to be written down and you’re forced to scrawl on your arms with your nails! Okay, that might be a bit of an extreme example, but it’s always a great idea to have a writing resource on-hand, so you can jot down thoughts, observations, and even things to remember while you’re out and about. And if you don’t have a small notebook and pen, now’s a great time to invest in one. Writing can serve any purpose you want it to, and that’s why non-writers can write, too. You can keep a gratitude journal where you write things you’re grateful for; or a reflection journal where you express the highs and lows of your day or week. 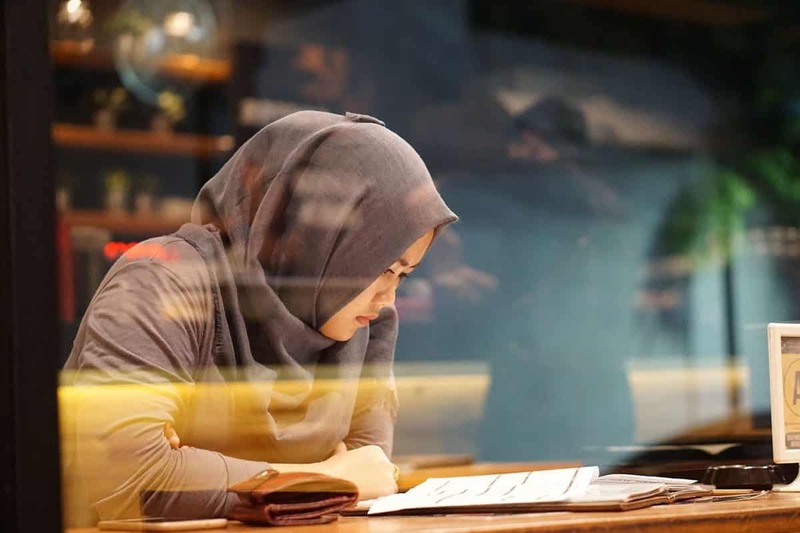 You can also benefit from writing insights you gain when studying the Qur’an — maybe a word in the translation jumped out at you, or maybe you want to remember a particular hadith connected to a verse in the Qur’an. Even a simple list of things you want to accomplish in a day transfers words from your often overcrowded mind onto paper, so you operate with a clear head and with greater focus. If you find it a challenge to write on glaringly blank pages, why not decorate them? Just like people design their laptops, and phone cases to put their own flavour into the design, decorating your notebook will make a difference. Simply check out a stationery shop to explore what fits your taste and style. When putting pen to paper, there’s no right or wrong. Placing pressure on yourself to write ‘perfectly’ is, in fact, one way to hold your pen hostage. Give yourself the permission to accept all the words that flow from you. And if they make you cringe at first, that’s fine. Just like babies stumbled a hundred times before finally walking with ease, you can improve over time. Progression over perfection — always. Once Ms K. gave herself the permission to pause to pen, she finally allowed words to tumble from her head in a way that led to her having greater clarity in her client consultations and being more present when at home. Writing is a powerful tool that comes with an array of benefits to learning, clarity, creativity, and connection. From having ah-ha moments about your day (week, or month), to recalling things you might have otherwise forgotten, writing can be a part of your daily life that ups your productivity and focus and preserves a tradition well-established in our rich Islamic history. It’s time to start writing. When you feel overwhelmed and feel like your life needs an overhaul, pause, put pen to paper, and unload. Our upcoming retreat is the perfect opportunity to have that needed pause to rejuvenate and reorient yourself. Imagine taking a break to somewhere serene and scenic, and taking part in a tailor made, life changing experience to discover how you can become the best version of yourself. Our annual retreat is not to be missed. Keep an eye out for upcoming information. Places are limited. When was the last time you used writing to de-stress and clear your mind? How did it affect you? Share with us the comments.